It has been almost four weeks since Erie News Now released the tape of four police officers using acts of excessive force during the arrest of Montrice Bolden. While viewing the tape, you are able to view Bolden being restrained with punches and kicks to his face, along with his head being slammed into the hood of a police cruiser. Citizens of Erie are still wondering why the arresting officers have not been held accountable for their actions. One day after “When Enough is Enough” was published, Erie News Now reported that a man named Tyrone Marrow filed a civil lawsuit in the United States District Court against the City of Erie and as many as 8-12 officers. The lawsuit states that on the morning of July 1, 2015, Morrow was falsely identified as an African-American man who was believed to be unlawfully carrying a gun. He suffered multiple spinal injuries, which forced him into the hospital for seven days. The complaint also stated that the Erie Police Department has “encouraged, tolerated, (and) ratified a dangerous environment of police brutality. 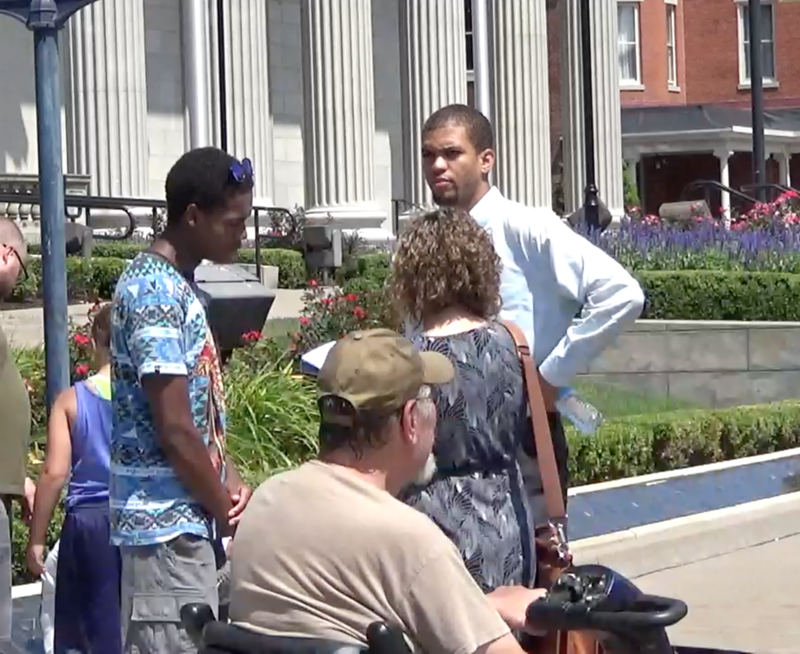 On August 10, about a dozen of the “Take Back Our Streets” members conducted a peace rally in front of the Erie County Courthouse to express their support for Montrice Bolden, before he entered room 117 for his preliminary hearing with Judge Paul Urbaniak. Cameras and recorders were not allowed in the courtroom, yet the information that was shared for an hour and 45 minutes left a few people at the preliminary hearing puzzled. Assistant District Attorney Paul Sellers presented his case with Erie Police Detective Christopher Janus as his star witness. Janus took the stand by testifying about the events on the evening of June 27 outside of TJ’s Traffic Jam. Accusations of Bolden’s alleged actions were described to the court, as what is listed on YourErie.com and GoErie.com. Yet, these local media outlets left out a great amount of valid information in their news reports. Janus admitted to the court that his testimony was based on a police report that was reproduced from multiple supplemental reports provided by the arresting officers. Janus testified that Bolden was tased two times during the arrest, yet that information was not listed in the report given to the defense nor the judge. When the topic of the officers using excessive force during the arrest of Bolden, Janus stated the officers used what he calls “distractionary blows.” This was displayed on the video as punches and kicks to Bolden’s face. While on the stand, Janus testified that two body searches were conducted on Bolden before he was transported to UPMC Hamot for his injuries. Bolden was not in possession of any drugs during the two searches. As the hearing went on, Fitzpatrick argued that the Bolden’s alleged actions were not captured on tape and all of Janus testimony against Bolden was more so “hearsay” and not facts. Fitzpatrick stated to GoErie, “My favorite detail of this whole thing… we glance over the fact that they never had a reason to approach the vehicle in the first place. The defense stated that the DUI charge should not stand because he was not operating the vehicle. The judge then agreed to drop the DUI charge along with two counts of possession of a controlled substance. The Take Back Our Street Movement of Erie, PA plans to speak on the case and the lack of police accountability in support of Bolden during an upcoming Erie City Council Meeting on August 17, 2016 at Bagnoni Council Chambers, City Hall from 7:30 pm to 8:00 pm.